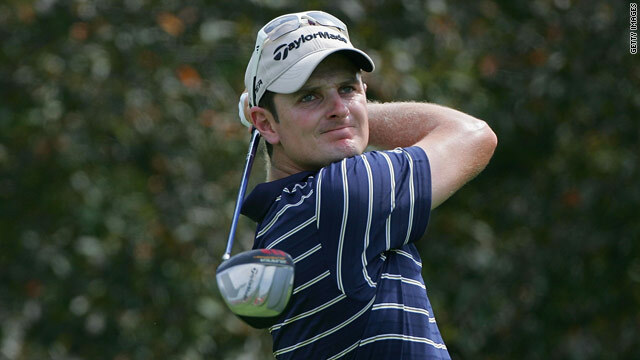 Justin Rose is well placed to win his second consecutive PGA Tour event at TPC River Highlands, Connecticut. (CNN) -- Justin Rose is on course to secure his second straight PGA Tour victory after a third round 68 saw him retain his lead at the Travelers Championship in Connecticut. The Englishman's two-under par round at the TPC River Highlands course, leaves him on 16 under par, three strokes ahead of 2003 British Open champion, Ben Curtis, with American Vaughn Taylor two strokes further back. After posting a tournament record total for 36 holes -- with rounds of 62 and 64 -- Rose's progress on Saturday was more sedate. The 29-year-old looked on course to post another low total after a birdie at the par three 5th, where he nearly had a hole-in-one, and followed it up with another birdie at the par four 6th. But his progress was checked when he found the water off the tee at the par five 13th to post his first bogey in 37 holes. He repaired the damage soon enough with a birdie at the 15th and negotiated the closing three holes without mishap to post a three round total of 194. Afterwards, Rose lamented his fortune on the greens but was satisfied with his round. "The tale of the day was that I made nothing on the greens. The longest putt I made was 4 feet, 10 inches for par on 17," Rose said, PGATour.com reported. "So, I'm really happy to have a day like that on the greens and still shoot 68 and still maintain my lead," Rose added. Second-placed Curtis shot his best round of the week, carding a 64 to take him to 13-under par. A stunning back nine included five birdies and saw him home in 30 strokes. "I just got to keep playing aggressive when I need to and just keep hitting the greens and picking the right club," Curtis said, PGATour.com reported. "You know, it's one of those weeks when if you shoot par, you're going to go backward," he said. Vaughn Taylor's three-under par 67 leaves the American a stroke adrift of Curtis on ten-under. Behind him, seven players are tied for fourth place including American Ricky Barnes whose third round 64 saw him jump 30 places up the leaderboard. Former U.S. Ryder Cup captain, Corey Pavin shot a one-under par 69 and also lies fourth, maintaining his hopes of winning on Sunday. A victory for Rose at TPC River Highlands -- to go with his win at the Memorial Tournament three weeks ago -- would go some way to alleviating any disappointment of missing out on qualifying for the U.S. Open last weekend, which was won by his Ryder Cup team-mate, Northern Ireland's Graeme McDowell. It would also boost his confidence ahead of next month's British Open at St Andrews -- the tournament where he made such an impact as a 17-year-old amateur, finishing fourth at Royal Birkdale, Southport in 1998. Meanwhile, American Cristie Kerr goes into the final round of the LPGA Championship holding an eight stroke lead over her nearest rivals Japan's Mika Miyazato, South Korean, Jimin Kang and Spain's Azahara Munoz. Her 13-under par three round total of 203 at the Locust Hill Country Club course in Pittsford, New York is the biggest 54-hole lead in LPGA Championship history. But Kerr, the world number five, insists that there is still work for her to do. "I think I've got to go out and first things first, I've got to take care of my job. You can't rest on your laurels, especially not on a golf course like this, set up like this. I've just got to keep going," Kerr said, the UK's Press Association reported. The 32-year-old's three-under par 69 on Saturday complemented an opening round 68 and a flawless second round of 66. Kerr, who won the U.S. Women's Open in 2007, will climb to first in the world rankings should she win on Sunday and current world number one, Japan's Ai Miyazato fails to finish in the top two. Miyazato currently lies in a tie for 24th place, 14 shots off the Kerr's pace and six behind the trio of closest challengers.